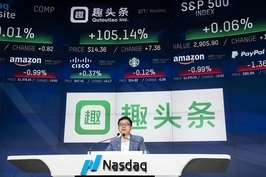 Making hay while the sun shines has become a major theme for offshore-listed Chinese tech firms these last few weeks, as many take advantage of a sentiment uptick to raise big new piles of cash. This week game livestreaming platform Huya became the latest to announce such plans, aiming to raise more than $500 million by selling additional shares into the market. The granddaddy of the recent fund-raising frenzy came last week from internet giant Tencent, which announced its own plans to sell up to a whopping $20 billion in medium-term notes. Such an amount sounded staggering to me, as it’s well above the total net worth of most of China’s internet companies. But when you’re one of the world’s most valuable companies like Tencent, which is now worth around $460 billion, it seems you can do that kind of thing in the current climate. This week we’ll turn our spotlight to one of the smaller recent fund-raisers, a company called Qutoutiao Inc., which has found a lucrative spot in the emerging space for content aggregators. In my view, these companies are something akin to what Google was in the 1990s, helping web surfers to make sense and organize the flood of news, movies, music and reams of other content that seems to be growing exponentially on the internet. But whereas Google has become a supermarket for internet users to find their way around the web, this newer generation of aggregators is more like convenience stores that help people in specific areas like online news, videos and literature. 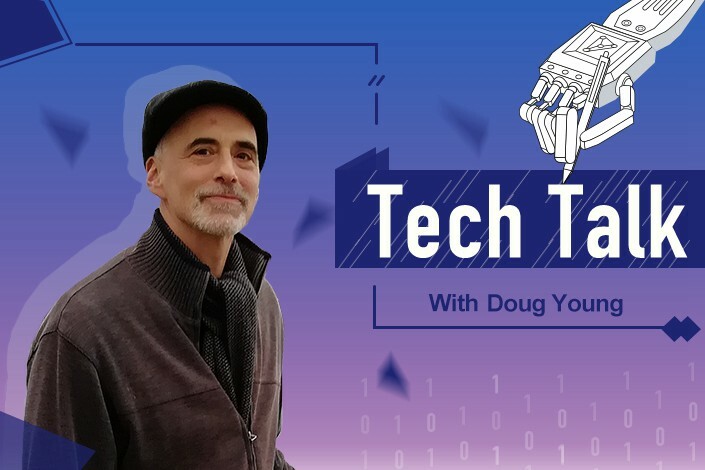 What’s more, this newer group has become quite adept at “pushing” content towards readers by using algorithms that try to figure out what they like based on their past habits and making suggestions. I got to see how effective these sites are when one of my younger colleagues came into work one day last year all bleary-eyed due to lack of sleep. The culprit, it seemed, wasn’t personal troubles or even run-of-the-mill insomnia. Instead, it turned out she had discovered one such short video site and spent half the night on it, mesmerized by the steady stream of offerings it pushed her way. Qutoutiao is one such operator in this space that has also been at the fund-raising trough these last few weeks. The company went public last September, but was only able to raise $84 million — a far cry from the $300 million it had originally targeted — due to weak investor sentiment at the time. Clearly in need of more cash, it splashed into the headlines over the last couple of weeks with a two-part plan that raised around $200 million combined. The lion’s share of that came when it announced its receipt of a $170 million loan from e-commerce giant Alibaba. That loan had an option for conversion to up to 4% of Qutoutiao’s stock, signaling the pair was looking at future strategic collaboration. Alibaba formed the tie-up even as rival Tencent was already an even larger stakeholder in Qutoutiao, having picked up 7.7% at an earlier stage in the company’s development. 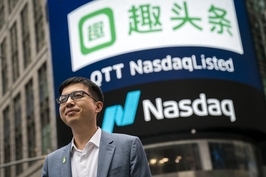 Qutoutiao’s shares have been on a bit of a roller coaster ride since its initial public offering (IPO), which shows that investors are still trying to figure this company out. 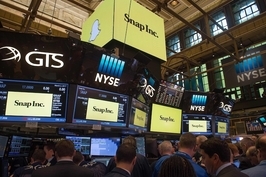 The stock initially rocketed out of the gate by more than doubling from its IPO price of $7 per American depositary share (ADS). But then it quickly fell to earth and was trading as much as 42% below its IPO price in December, before embarking on another rally that has left it nearly 30% ahead as of early this week. When it comes to this company, the big elephant in the room, quite literally, is the much larger ByteDance, owner of the better-known Jinritoutiao news and TikTok video apps, the latter of which is better known in China as Douyin. Qutoutiao’s own IPO prospectus shows that Jinritoutiao had about a fifth of the market for content aggregators in China last July, compared with its own distant No. 2 ranking with about 4% of the market. That difference shows up in market value. ByteDance has been called the world’s most valuable unicorn, defined as startups worth more than $1 billion, after reportedly getting a $75 billion valuation at the time of its last major funding last year. By comparison, Qutoutiao is worth a far more modest $2.2 billion, based on its most recent valuation. I do believe the ByteDance figure is probably a bit inflated since it almost certainly came from the company itself, even though most reports cited anonymous sources. But even if the figure is more like $50 billion, it still shows how much potential investors see in this new generation of smart aggregators. Interestingly, ByteDance is one of the few major internet companies that so far has refused to take major investment from either Alibaba or Tencent, which is probably why both of these giants have been forced to settle for Qutoutitao. Analysts were generally upbeat about the Alibaba investment, with UBS citing “multiple opportunities” for the companies to work together. Nomura was also positive about the company’s newer Midu Novels service that targets longer-form readers. Both Qutoutiao’s core news app and its newer Midu are growing quite rapidly. The original news app was aiming to double its users from current levels to about 60 million by the end of this year, according to Nomura. Midu was aiming for an even faster rate of growth to between 15 million and 20 million users by year end, versus a current 6 million. One of Qutoutiao’s biggest problems is that it pays people to read its content, a clear move to boost its user base but not exactly the best business model. But Nomura points out the company is aiming to lower those fees sharply to around 0.17 yuan ($0.025) per user per day by the end of this year, from 0.25 yuan in last year’s third quarter. The bottom line is that this company is still in the teething stages, as reflected by its ongoing losses that reached nearly $300 million last year, even as its revenue grew by nearly a factor of six. At the end of the day it does seem quite well positioned to become a major Chinese player, and perhaps even an eventual global contender in the fast-emerging content aggregation space.